A python eating a ring tail possum whole has been captured and streamed live on Facebook, after a snake catcher was called to a Chapel Hill home in Brisbane, Queensland on Thursday. The hour-long video shows the slow process that ends with the snake supporting itself against a wall as it swallows the possum’s long tail. 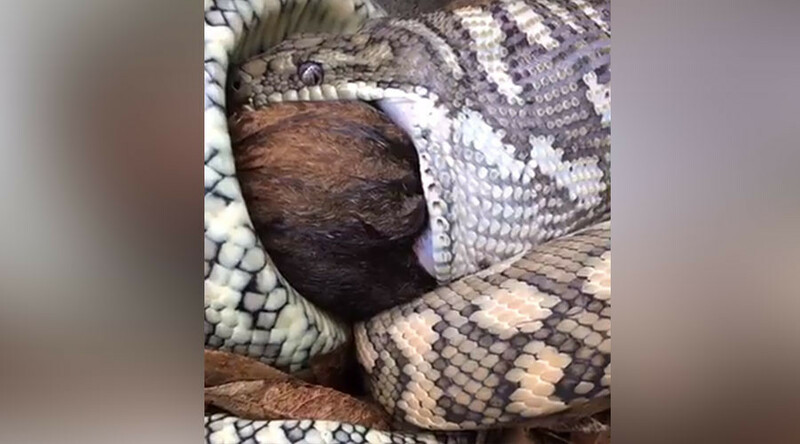 Posted by Snake Catchers Brisbane, Ipswich, Logan & Gold Coast, the video shows the regular coastal carpet python slowly ingesting the large possum inch by inch. The video starts as the snake is halfway through its lunch, having already ingested the possum’s shoulders. Viewers were able to ask questions as they watched the snake eat its snack. Snake catcher Lana Field highlighted the importance of allowing the snake to eat in peace so it doesn’t start to regurgitate the possum. Aside from it being a waste of a good meal, the possum could also scratch the snake’s insides on the way out. She also confirmed that the possum was killed by the python before it started eating it. The video lasts for almost an hour. After the snake had swallowed all of the possum, Field allowed it to rest before removing it from the garden. It will take about two weeks for the snake to fully digest its furry lunch.